Put together atmospheric doom metal, Scandinavian death metal and groovy catchy rock. Place it on French soil and what do you get? There are some things particular to all the French bands I've heard or talked with. They work hard to sound like everyone else of credit and idolize their faves; if not utterly defendable, that makes them at least very focused, thoroughly perfectionistic musicians. At the same time, they want to sound completely different, weird, and this may have forged a distinctive French sound: muffled, with an extensive content of mid-tempo "raining" riffing. 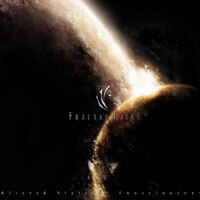 I feel Fractal Gates have incorporated influences from the outside in an elegant manner. I hear remnants of Paradise Lost anno 1992-1995, without it sounding embarassingly like a plagiate. Altered State of Consciousness has grown through the listenings. This honourable record is to be listened to with your meticulous attention. Comes out in digipack version.